By coating, ingredients in Knorr Coating Mix Flour before dipping them into wet batter will prevent the batter from sliding off after frying. 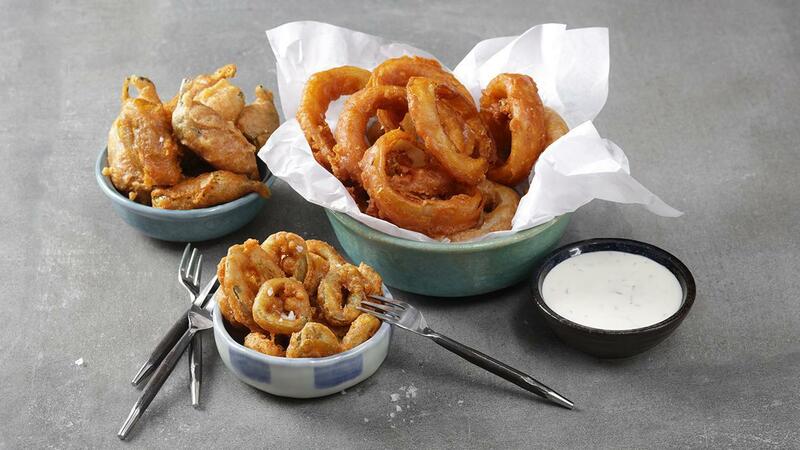 Slice the onion rings down the side to form large rings and Slice the jalapeño chillies in rings or length wise; marinade them with Knorr Coating Mix - Spice Marinade (50g) for 10 minutes. Make batter by mixing Knorr Coating Mix – Coating Base powder (40g)and wheat flour together and sieved twice to a Tray. Mix the sieved flour, cumin and turmeric with iced water gradually and prepare a smooth thick batter. Dip the marinated vegetables in the batter and deep Fry at 180°C until golden brown. Finely chop the mint & mix withHellmann's Classic Mayonnaise and yoghurt.